For all of us trying to figure out the best way to navigate through this crazy adventure called life, love and loss are themes of deep significance and urgent interest. We will tackle this topic in two parts. Part one will be on love, and part two on loss. Into the Woods, a recently-released movie based on the original Broadway musical, features several fairytale characters in an intricately woven plot. There are two different paths we can choose to take on the issue of love and loss. 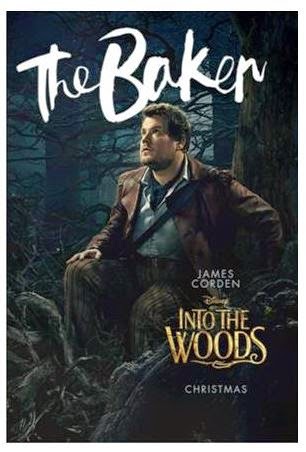 Two Into the Woods characters in particular illustrate these distinct paths: Prince Charming and the Baker. First, we see how each of these characters chooses to love. Prince Charming does not truly love - he merely seeks his own pleasure. Thus, all of his bravado and adventurous pursuits ultimately amount to something superficial and disappointing. The Baker, on the other hand, does truly love. In spite of his relative lowliness and less than exciting personality, his love amounts to something noble and enduring. Let's see how this bears out in the story. At first, Prince Charming pursues Cinderella with a flattering intensity. He sings a song called "Agony," in which he bemoans that "...the one thing you want, is the only thing out of your reach!" (May I suggest that he wanted her so much precisely because she was out of reach.) After a long and exhilarating search - you all know the story - he finds her. They get married and live happily ever after ... except for the happily ever after part. Later in the story, we see that the Prince has entirely lost interest in Cinderella. He beings restlessly looking for someone else to pursue, and ultimately he is unfaithful to his wife. Both before and after his relationship with Cinderella, Prince Charming remains essentially the same: entirely self-seeking. Although done apparently in the pursuit of love, his highest pursuit is in fact his own subjective satisfaction. He begins and ends his quest for Cinderella with his own self-centered interests. In search of pleasing only himself, he is left empty and alone. No contentment, hope or new life could be found in this type of lifestyle. Only a shallow and an inherently insatiable and endless hunt for satisfaction is what could ever constitute this type of pursuit of happiness. Prince Charming's "love," besides being pathetically ignoble, is also embarrassingly ineffective. No matter how many princesses he discovers and woos, he will always end up disappointed and alone. Because satisfaction is his only goal, he will never reach it. For the only real way to be fulfilled in love is to see past our satisfaction to the beloved person. Love for an eternal soul is enduring, because the soul (love's object) is enduring. "Love" for pleasure is fleeting, because its object is fleeting. Pleasure is in fact all the more fleeting when it is sought as an end for its own sake. Satisfaction is something that cannot be hit by aiming directly at it, but rather, it must be hit on the path to some other target. Think about the example of "having fun." Fun is something that can't really be thematic as if it's going to be achieved. You can't plan "fun" like you can plan food or music. Fun has to arise out of something else that is properly thematic, like spending time with dear ones or enjoying a common interest together. It can't be the primary end that is focused on. It must, rather, be the natural consequence of some other end. Satisfaction is the same kind of thing. The Baker, in contrast, loves his wife. He is faithful to her. Hildebrand says: "Faithfulness is at the heart of every true and deep love. It is immanent to its very nature." (2) His for for his wife is, therefore, true and worthwhile. Unlike the Prince, the Baker's love is not limited by his own ego. The Baker is not pursuing himself. In loving his wife, he transcends himself to reach both her and their common goal: parenthood. Because the Baker loves his wife, for her own sake, he ends up with treasures greater than anything Prince Charming could attain. The Baker is not in love with love, or in love with himself. He is in love with a woman. And because he cherishes her - because she is thematic - his love for her is lasting, not fleeting, and joy comes as a natural consequence. Another testament to the greatness of the Baker's love is that new life comes from it. The Baker and his wife are not on a quest for self-satisfaction; they are on a quest to have a child together. This common goal unites them in purpose and together then transcend themselves, loving another human being into existence. (1) Hildebrand, The Heart: An Analysis of Human and Divine Affectivity, 120. (2) Hildebrand, The Art of Living, 23. (3) Hildebrand, The Art of Living, 19.